Pithead miniatures is only a small part time business but we consider that our products provide customers with unequalled choice and value in this scale. 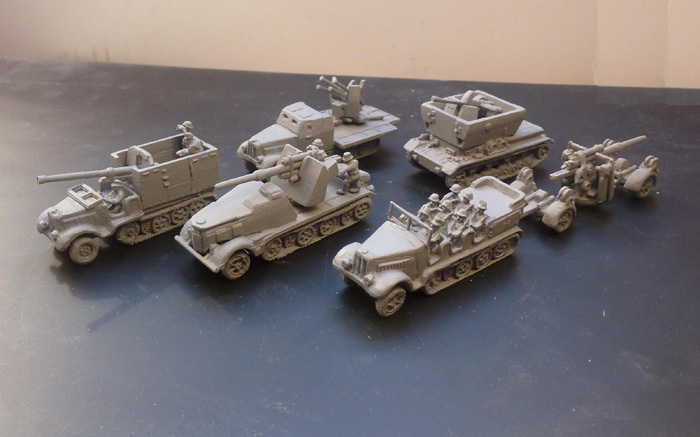 Pithead produce the biggest range of 10mm models for WW2. We have always been and will continue to be the most inexpensive maker of multipart models in this scale. We produce models for the greatest range of combatant nations of any manufacturer in any scale. Our models are scrupulously researched, for example our Sherman M4 A4s have longer track sets than our M4 A1´s and even our Churchill tanks have the correct number of tiny bogy wheels . We consider crew figures for open topped armoured vehicles are essential, so we provide them. Our models typically consist of five or more separate parts allowing a greater scope for detailing. Profits are not our primary motivation, who else would make Norwegian, Yugoslavian, Greek, Slovakian and free French ranges. Whereas most companies consider an Opel blitz is sufficient to representation for German softskin models we do not. We produce more softskin models than any other company in any scale. Pithead Miniatures are grateful for the collaboration of Carl Abelins software company Core Applications in the presentation of these pages. For information about the range, please e-mail Phil at vanilla55@sky.com. See the updated template for the new releases! To make ordering easier you can use the order template for downloading under 'How to Order'. If you cannot use the template then just send us a list of the model code numbers and quantities you require. "In the pipeline" Means the model is partly finished on the work bench and will realistically be released within the next 6 months but probably in less time than this. "Not available being remodelled" Means that the model has been withrawn but there are plans to remake it.